As DHTMLX Touch was discontinued, the solution described in the article is no longer supported. Check a new guide in our documentation concerning touch support in dhtmlxScheduler. 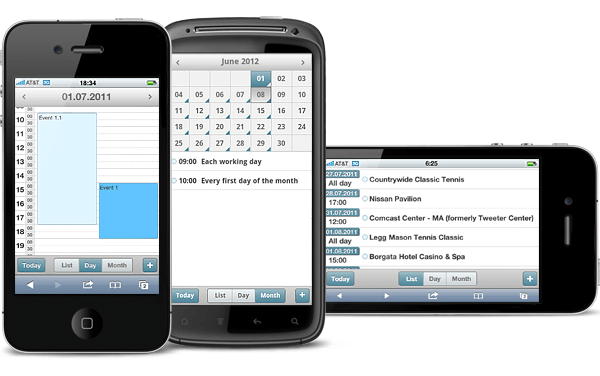 Download the new version of DHTMLX mobile scheduler. The new release includes a number of bug fixes, UI improvements, and new cool features. One of the major enhancements in this version is the ability to work with the scheduler even if there is no internet connection. Users can add, edit and remove events offline. The changes are saved to the local storage and then updated on the server side when the user comes online. With this update, we have added support for recurring events. Users can now define the recurrence rules and schedule events to repeat every day, week, month, year, or at custom interval. 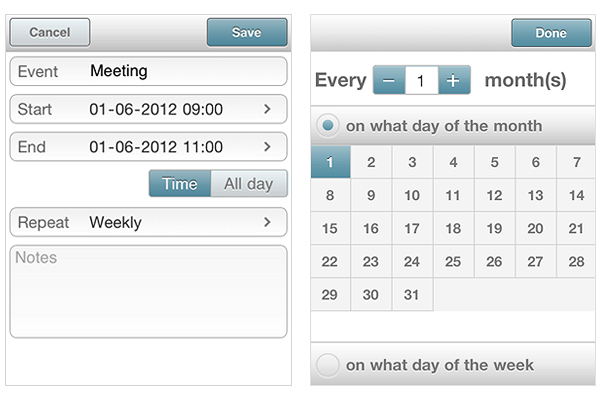 We’ve also added some user experience enhancements to make the scheduler more intuitive and easier to use. For example, all-day events are now marked as ‘All day’ in the list view. Also, the event editing form has been updated to have more user-friendly interface. You can download the latest version of our mobile scheduling component from the dhtmlxScheduler page. The mobile scheduler is now distributed as a separate package but its use is covered by dhtmlxScheduler license. You can use it for free under GNU GPL v2. Commercial license cost starts from $149 (includes dhtmlxScheduler for desktop and mobile). Looks nice! I will bear it in mind for my next project. Hello, i need your help. I try to customize height of Details(Notes) Scheduler. But i try to use css is not work. Our technical support team will look into this issue. Please post this question to the scheduler’s forum (registration is free). Our technical support team will help you.